In a discussion on Wednesday about the Climate Trust’s filing with the Court of Appeal, the SST reporter asked me about allegations of judicial bias. He claimed to have information that the appeal was based upon the judge’s forestry investments. I assured him that the appeal made no mention of bias and that this question had arisen only in the course of the current costs argument in the High Court. At this stage, the Climate Trust has merely asked the judge a question by way of a Memorandum to the Court. Any issue as to whether Venning J should recuse himself from the costs dispute will not arise until his financial interests (if any) under the ETS are known. In the internet debate which followed the September release of the substantive judgment in the NIWA case, a number of commentators drew attention to the complaint against Venning J lodged with the Judicial Complaints Commissioner by Dr Gary Muir and others associated with the Trinity tax case. That complaint was related to the judge being a director/manager/shareholder of Tahakopa Forest Ltd (“TFL”) the owner of a 200ha radiata pine forest in Southland, planted in 1992. TFL has registered to receive carbon credits under the New Zealand ETS established in 2008 by the Climate Change Response Act. A search of the company records revealed that Venning J had resigned as a director and sold his shares in TFL in April 2008. However, Dr Muir’s papers allege that TFL is merely the trustee for a forest-owning partnership in which Venning J (or his family) holds an ongoing 25% interest. It was appropriate, therefore, to ask the judge himself whether he still retains his earlier financial stake in the ETS. The Climate Trust has argued that NIWA’s adjustments to historic records heavily over-state the warming that has actually occurred in New Zealand over the past century. NIWA’s projections of future warming are based on computer models which are calibrated to reflect those adjusted past records. If NIWA’s temperature predictions for 2080-2100 were sharply reduced, there would be no basis for government policies aimed at averting future dangerous climate change. Thus, the justification for an ETS will be severely undermined if NIWA loses this case. Last year, the Law Commission published an Issues Paper [hyperlink www.lawcom.govt.nz/…/lc2919-towards-a-new-courts-act-first] in response to a Member’s Bill introduced by Green Party MP Kennedy Graham which sought to establish a register of judge’s interests. This paper canvasses various viewpoints regarding circumstances in which a judge should recuse himself or declare an interest. It notes that New Zealand law was settled by the 2010 Saxmere case relating to then Justice William Wilson. Tahakopa obviously has a significant pecuniary interest in preserving the ETS – but that issue is not “directly” in question in the NIWA case. If the judge has retained his interests in Tahakopa, the key question for recusal would be whether there is a “real and not remote” possibility that the outcome of the case might have an impact on future ETS policy. These issues will only arise if Venning J retains a material pecuniary interest in the Tahakopa forest. That is the first question to be answered. Sure looks like a case of grabbing at straws to me, Bazza! Hasn’t the government’s evisceration of the ETS over the last 4 years rendered forestry credits worthless anyway? The Climate Change Response Act provides a cap of $25 per tonne, but all the modelling which formed the basis of Government decisions predicted the market price would go a lot higher. Many scenarios involve pricing of $100 per tonne. The legislated price in Australia is $30 per tonne next year, and rising the following year. The EU price has crashed this year, due to the GFC,etc. In 2007, the EU price dropped to zero, but it still bounced back. And the NZ price was $20 only about a year ago. Last week, Labour, Greens and Maori Party all voted to double the NZU rate, restrict imports and remove the $25 cap. So, all it takes for the NZU value to soar is a change of Government. The main parallel is that the plaintiff was an under-resourced unknown up against a large public institution backed by the establishment and by the government’s cheque book. But it becomes much harder when the judge himself has some skin the game. That didn’t apply in the Newbury case. How many more times can the NZCSET shoot it itself in the foot? Having a part interest in a forest is hardly a conflict of interest in a case about NZ’s temperature record. Most forest owners wish the ETS did not exist as it has created huge potential liabilities when it come to clearfell. Emitters buy cheap overseas credits whereas local forest owners dare not sell for almost nothing as they will require most of those credits later. You really do not want to be associated with the architects of the Trinity tax scam. Upsetting the judge who is going to arbitrate on costs is not very smart either. Not partial; not favoring one more than another; treating all alike; unprejudiced; unbiased; disinterested; equitable; fair; just. The question is whether Judge Venning “was able to perceive” that he might be better off by espousing NIWA’s side of the controversy. Well, if he thought about it, he couldn’t help but perceive a personal advantage from carbon credits by preserving the status quo. If he didn’t consciously think about it, wouldn’t his sub-conscious have given him a shove? How can he say a layman would not regard this as “a real possibility”? If there is no benefit to the forestry industry why is there such an outcry from that sector regarding the drop in value of a carbon unit? I beg your pardon? “Shoot it itself” in the foot? This is the pot calling the kettle black, I think. Apart from the fact that all your criticisms are empty – so the kettle is not black. It’s a good time to consider planting trees, says incoming New Zealand Farm Forestry Association president John Dermer. “A 20 per cent plus lift in log prices over the last year, with the prospect of more to come, the ability to sell carbon [emission trading units] and Government support for new planting add up to an exciting future,” Dermer said. So, actually, having a forestry investment is almost completely about NZ’s temperature record and the ETS, through which the government has distorted the economics of forestry. We’re NOT associated with them! That’s an invention by the reporter! Finally, what do you mean, upsetting the judge? The judge won’t be upset by a question. Even if you might be. For example, what is the evidence for a dangerous human influence on the climate? Don’t be upset – it’s just a question. Once again, you over-state the importance of the 7 Station Series, whether the warming over NZ’s land surface is 0.3C/century or 1C/century is only of minor import to climate science. People plant trees primarily for selling timber at a later date, the carbon credits are incidental. Now that the Government has watered the ETS there is no upside and a large potential future downside if future CO2 emissions are heavily penalised. The question implies that the Justice’s decision is biased and not impartial, just as you have tried to imply that NIWA’s scientists are biased and not impartial. True professionals make decisions based on their expertise, totally independent of personal considerations. No, Simon, you miss the point entirely. If NZ has warmed by 0.3°±0.3°C over the last century, then the entire AGW scare has passed us by. We might be sympathetic to the Northern Hemisphere people or island dwellers and dutifully attend endless climate meetings, but we won’t have any stake in the game. It simply isn’t our issue! There will be no need for New Zealanders to be world leaders, or to bear the costs of a world-leading ETS. No need to impose flood zones around our coasts, or to increase the size of stormwater pipes, or to have endless RMA hearings about what might happen in some distant future. And we can save tens of millions of dollars now being spent by the science faculties of all our universities trying to study the effects of non-existent warming. Right. And how do we know who is a “true professional”? And are they all professional at sub-conscious levels? How do you know? Actually that is not quite correct. The lay judges in the Newbury case were well known for their opinions on climate change sceptics. Furthermore, the BBC has extensive investments in renewable energy companies though its pension funds. The BBC blocked a completely reasonable FOI request from a citizen. No, it would only mean that there is a lag from the surrounding temperature-moderating oceans. “World-leading ETS”! Costs to business are trivial and involve capital outflows from buying cheap credits from Eastern Europe. Emitters are encouraged to maintain or increase emissions while they can as it may not be possible in the future. The scheme encourages the exact opposite behaviour of what was originally intended. I obviously have a lot more faith in the legal system of this country than you do. A lawyer has to be pretty well-respected to become a judge. Some might be conservative and pedantic but I think they’d all be pretty honest. Suggesting that Justice Venning’s judgement was clouded because he has a part-share in a forest is, to be frank, absurd. The NZCSET are employing the same tactic as Bradbury and Muir tried with Trinity and look where it got them. Do you seriously think the judge was completely impartial i.e. “without fear or favour” – his oath – in this case Simon? If so, what specifically from his decision are you basing your conclusion on? What genuinely impartial but (hopefully) competent judge would overlook three professional statistical reviews for example? It may come as a surprise to you Simon, but there are people, myself included, who after reading the decision have identified clear favour toward NIWA and they would rest easier if they knew Tahakopa was not a factor. especially given J Venning has been tardy in the past when recusing himself was the obvious action in similar circumstances. Even if Geoffrey Venning is no longer a party to Tahakopa, are say, his children beneficiaries to a trust that is and wouldn’t that play on his judgment? Neither can judges always be relied upon to get facts right in a climate related case (or any case for that matter) even at the appeal stage of proceedings e.g. in the Coalition for Responsible Regulation v. EPA appeal decision, 3 judges reported that in their opinion the IPCC assessment reports were peer-reviewed. > protect the impartiality and integrity of the judicial system. Now is the time to have these questions answered and appeal rights exercised, that is the appellant’s right Simon. Or would you prefer that in this case the appellant just went quietly away, left rights un-exercised, payed in full for a possibly partial decision and stopped rocking the climate change boat as it were, preferably for evermore because the dissent of persisting offends you Simon? Rubbish of course. NZCSET made adjustments strictly in accordance with Rhoades and Salinger (1993) but NIWA’s 0.9 C trend was not reproduced, instead a mere 0.34 C, since corroborated by a GHCN-based series. Without that extra 0.56 C, NIWA’s grandstanding just does not have political punch so for them it is crucial to preserve but statistically it hasn’t because the NZCSET 7SS is statistically valid irrespective of J Vennings legal decision. Now wouldn’t it be a good look for the judiciary if after appeal, their legal decision recognized the statistical merit of the NZCSET 7SS? Are you conceding that oceanic influence is the dominant climate driver Simon? And what moderates ocean temperatures? Just like GAT, there’s been no warming in the 7SS this century and no warming in GSST. The warming in the 7SS last century was natural variability (Salinger and Mullen). There’s minimal warming in the Southern Hemisphere record (“global” warming is a NH phenomenon) so to hold out a 7SS lagging after ocean is really just saying the ocean (after solar) controls climate. No-one was wasting the court’s time Brando, the court was fulfilling an obligation. And yes we know how this will turn out eventually irrespective of legal proceedings – a statistically valid (reviewed and corroborated) temperature series standing alongside a series of as yet unknown methodology (or at best a loose application of what was applied rigourously by NZCSET). This solicitude for the valuable time of the Court doesn’t cut much ice. In every case that comes before a judge, one side of the argument has to lose. Brandon, I suspect you take the view that every case that doesn’t win is wasting time. On that view of the world, the Court never does anything but have its time wasted. 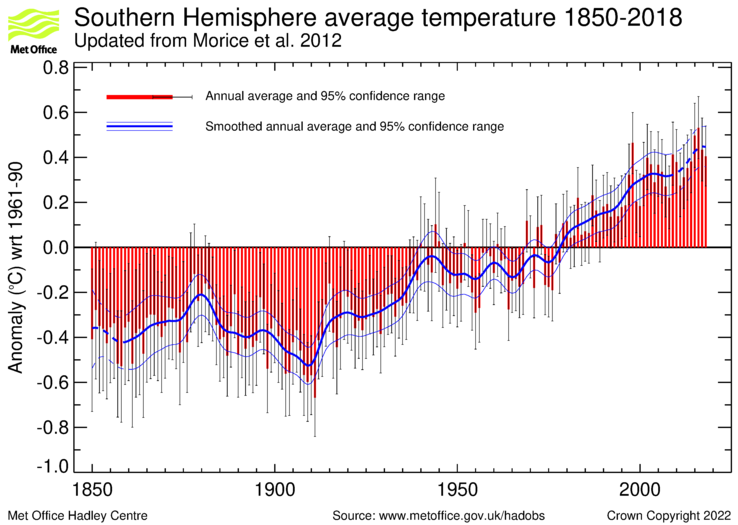 Interesting to note that the HadCRUT4 time series for the southern hemisphere is only +0.3C from the 1961-90 mean. An eyeball analysis looks about +0.7C/century which gels with the BEST estimate for NZ. There is definitely more warming occurring in the northern hemisphere than here. Wouldn’t it be good for all concerned if NZCSET and NIWA played nicely together and constructed a mutually agreeable and believable temperature time series for NZ? We now have a GHCN v2 12SS NZ series that corroborates NZCSET 7SS. That leaves NIWA on the outer for early 20th century. David Stockwell (Niche Modeling) is also in the process of compiling a cross-Tasman series so there’s more than just NIWA, NZCSET and BEST to consider as time goes on and the unadjusted, non-kriged data is showing just how unrealistic the outliers are. Oh, man. You cut to the quick, Stanley! Let me emphasise that when we asked NIWA what their adjustments were and why they made them, had they answered fully and frankly, we would now be in just such a collaboration. They were the ones to obstruct, delay and demonise.